Of course he did, and so did Sunil Geness (Director of Government Relations & CSR for SAP Africa) and Julie Cleverdon (Director of the Cape Town Science Centre). The foursome have been breathing, thinking and living Africa Code Week ever since. Blame it on their unshakable joy to serve, but there's no mountain high enough for this dream team. Claire is probably falling asleep in yet another plane as we speak, gazing at the horizon of her very own dream: empower 5 million young Africans with coding skills over the next 10 years. Carefully wrapped in her cabin luggage is Award #2 for SAP - Africa Code Week this year: the prestigious IIC Judges' Choice Award she just received from the Massachusetts Institute of Technology (MIT). 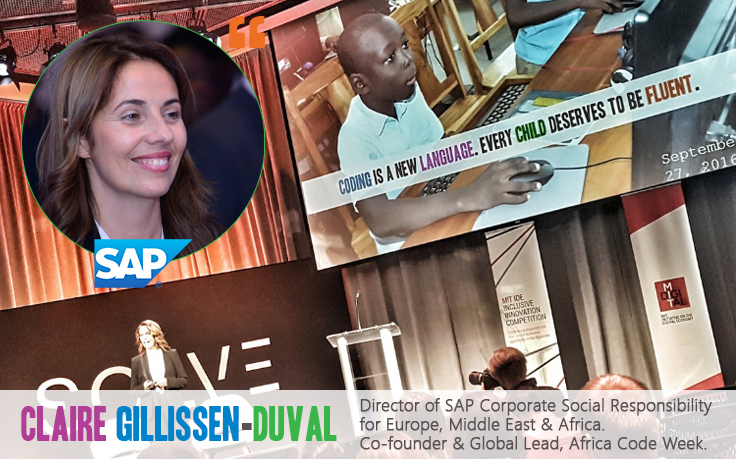 Based in Paris, Claire has been working with SAP for the past 8 years. This "dream team machine" knows a great team member when she sees one, and should a sentence ever get close enough to describing her, Bill Johnson's would probably fit: "You know you have a renewed mind when the impossible starts to feel logical."